So this whole experience was pretty amazing. It had it's share of disappointments, but obviously overall it's just incredible to just be a part of. So, I got a call on Thursday asking if I was available to go to the SAG awards. I was allowed to invite a guest, so again I asked Jeffry Griffin (Ryan Gosling's assistant in The Big Short) to go with me. When they found out that I was asking him to be my guest they actually offered to buy his flight from New Orleans to Los Angeles and they thought it was awesome that we were keeping in touch. They told me they were providing me with a private car and I should dress up etc. It was all happening so fast. The next day I was scrambling to get a haircut and grab a tuxedo. 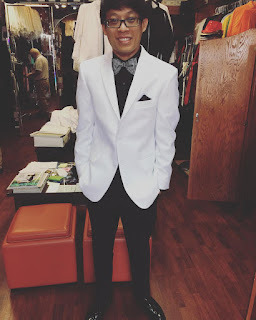 I personally thought that it seemed weird for me to rent a tux for the event. Or at least to rent the same kind of suit everyone else was wearing to look like I fit in. The stylist there recommended that I wear a white jacket with a black shirt and black pants. I showed a picture to my sister and she said it was a "hard no" and that I looked like I was going to prom. I took a look at the time and realized I was already running late for the hair appointment. The stylist assured me that it will catch people's eye without being too bold, so I decided to just go with it. The next day Jeffry came in and I helped him pick up his tuxedo. Then we went back and got ready for the private town car to pick us up. Apparently there was some mix up and while we were sitting around waiting for the call to come on my phone, Jeffry realized that the driver had contacted him 20 minutes earlier. So we went outside and got in the car and started heading out there. The driver was nice and related to us because she has a lot of family from Louisiana as well. The drive took a long time though (about an hour), and we ended up getting to the venue about 4:00 PM. As we got out of the car I could see a crowd of people already screaming at some of the other people coming out. I spotted Susan Sarandon, Jim Parsons, and a few other people getting out the same time as us. I didn't really have any idea what we were supposed to be doing so I called one of the paramount publicists and she told us to just walk up and try to find them. So we ended up checking in through security and then started approaching the red carpet. From my experience from 22 Jump Street, you still needed a publicist to get you through it though so we waited around for them to find us. When they eventually got to us, they told us that unfortunately there wasn't enough time to walk us down the red carpet anymore and we had to go around the side into the venue because we needed to be in our seats by 4:30 PM. It was pretty disappointing, but we just walked through the side and went inside.